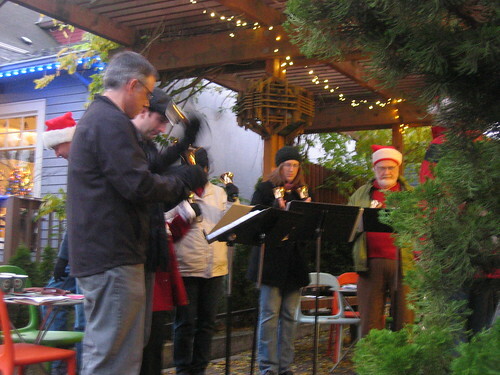 Today marked the 15th annual Holiday Magic festival in upper Queen Anne, though it was a first for me. In fact, much like many of the holiday activities in Seattle, I had no idea it was happening until I stumbled across it accidentally. But what a lovely thing to stumble across- I went to Queen Anne to get some dinner, and instead found tons of Seattleites roaming the streets, bell carolers, a pony ride, roasted chestnuts, bands playing, a marionette theater, and tons of giveaways and contests at the local stores- my husband won free chocolate at Chocolopolis. The highlight of the evening for me was another accidental happenstance- Bethany Presbyterian Church was lighting its tree just as I happened to walk out of El Diablo, and the crowd burst into ‘Joy to the World.’ It was one of those moments I wish I could have captured on film, but wasn’t quite prepared for. Still- it was a unexpected, magical interlude, and now that I know this exists, I’ll be sure to return next year.